Today’s IT leaders are faced with an uncertain economy, internal and external customers demanding faster response, ever-expanding data growth, and potentially dramatic implications from the proliferation of external cloud services. Today’s IT leaders need a new way of running their businesses. Are you ready for the future of IT? 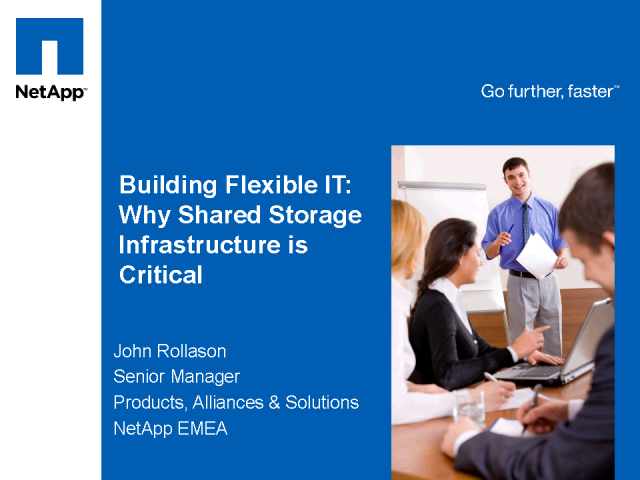 John will discuss how a Flexible IT approach built on a Shared Storage Infrastructure is faster and more efficient than traditional approaches to IT. He will review the 7 critical attributes of a Shared Storage Infrastructure to consider – Unified Architecture, Scalability, Integrated Data Protection, Non-Stop Operations, Secure Multi-Tenancy, Storage Efficiency & Service Automation.